Introducing the new Combo Power Bank and Gift Set from The Range. This gift set consists of a 4,000 mAh Multi Purpose Charger, a Hawk Ballpoint Pen and a Rotate Flash Drive with Lacquered Clip in 4Gb. 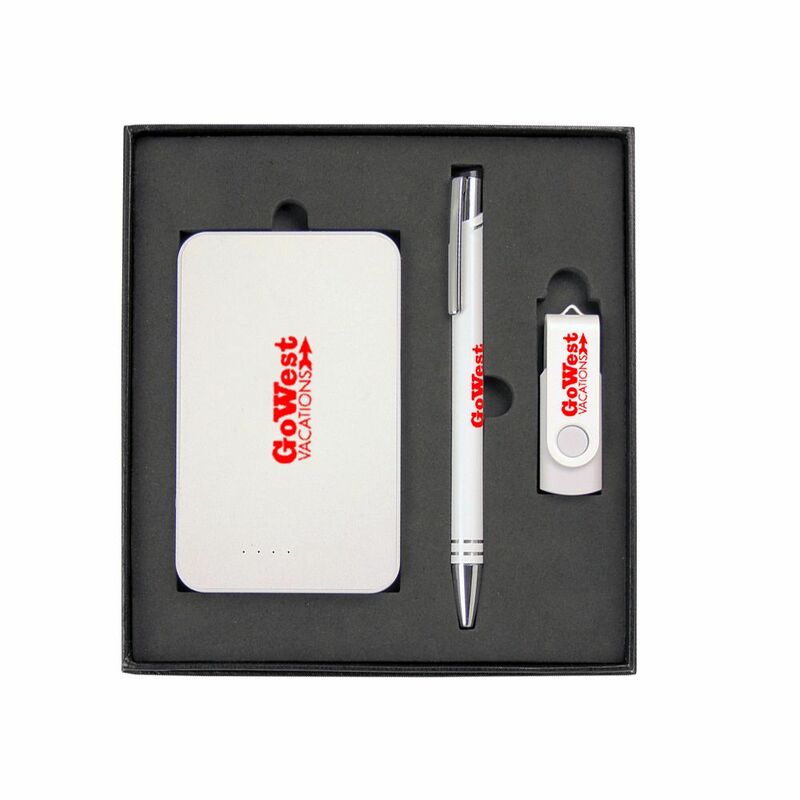 You can print your logo on the Power Bank, the Metal Pen and USB Flash drive for a consistent and professional look. Features : Each item is available in Black, Blue and White and can be purchased in this set or as individual items. Multi Purpose Charger (PB1001), Hawk Ballpoint Pen (6011), Rotate Flash Drive with Lacquered Clip in 4Gb (USB7860_BC_4G). When purchased as a set they are presented in a custom made 2 piece gift box with EVA insert for the presentation of each item. Material : Box: Cardboard and EVA Available Colours : Black, Blue, White Product Size : 110mm(w) x 68mm(h) x 10mm(d). Decoration Area : Print: 50mm(w) x 50mm(h) on powerbank and box lid; 50mm(w) x 5mm(h) on pen; 27mm(w) x 14mm(h) on clip of flash drive. Decoration Methods : Colour Print / Full Colour Print Packaging : Sitting in black foam insert and presented in a 2 part black gift box with black sleeve. Packing size 170mm(w) x 160mm(h) x 32mm(d) Can be used for conference and trade show events, education related gifts for universities, tafes and schools, Christmas gifts for your clients or staff or a great corporate business gift.